PLEASE NOTE: As of December 10, 2018 our supplier is running approximately 10 business days behind (they custom make every cushion as orders are received). 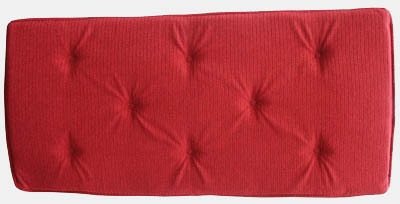 TV - Tufted Piano Bench Cushions- Add color, comfort and beauty to your music bench with these rolled edge sewn-tufted cushions. Constructed with 1" thick foam padding . Facing and backing material is soft acrylic/polyester and is soil & stain resistant. Each cushion has sewn in tie-down strings made of same material. Cushions are made to order for us as the orders are received and shipped directly from our supplier. Depending on their work load this can take up to a week or more.